It seems like everything Pharrell does is a hit. Not only are his records frequently achieving platinum status regardless of whether or not he’s on the boards or in front of the microphone, but his adidas NMD “Human Race” collaborations have been some of the most sought after pairs of NMDs in recent memory. 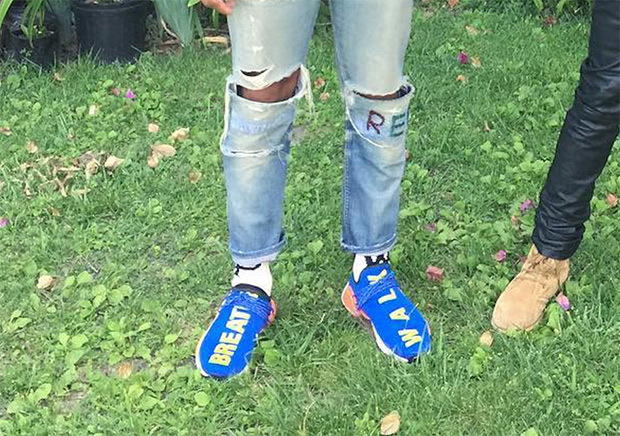 Today Skateboard P previewed a brand new adidas NMD Human Race sample while standing next to Lil Uzi Vert. The pair features “Breathe” and “Walk” callouts on the royal blue knit upper, but that’s all that we can tell from this distance. Yeezy Mafia did confirm that more NMD Human Race options are coming later this November in upcoming Trail editions, so perhaps this look is among that lineup. Stay tuned.